Transforming the world through “Christian Love in Action"
Holistic Faith: We express our faith in Jesus Christ through both words and deeds. Connecting Teamwork: We acknowledge the diverse contributions of each individual but value the common commitment and dedication to passionately serve together. Transparent Integrity: We strive to be accountable and just by creating a culture of respect and integrity through our work and service. Authentic Relationships: We value and nurture relationships and partnerships through compassion, trust and understanding. Transcending Excellence: We aspire to achieve excellence by going beyond expectations in all aspects of our services, programs and resources. Effective Leadership: We seek to provide the highest standard of educating, equipping and empowering volunteers to serve. The United Methodist Volunteers in Mission movement arose through the local church, as United Methodist felt called to express their faith through hands-on mission. The UMVIM motto, “Christian Love in Action,” is taken from 1 John 3:18, in which Christians are asked the love “not in word or speech, but in truth and action.” UMVIM has worked closely with the United Methodist Committee on Relief (UMCOR), providing teams to assist in recovery from natural disasters to violent conflicts. Volunteers have served in every continent, often but not always in nations with Methodist churches. 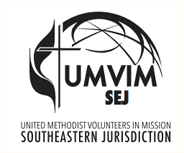 1972–A group of individuals from the Southeastern Jurisdiction formed a steering committee to organize what has become known as the United Methodist Volunteers in Mission (UMVIM). 1976–UMVIM became an agency of the Southeastern Jurisdiction Administrative Council. 1988–General Conference suggested that every annual conference name a Volunteer in Mission Coordinator to work cooperatively with the General Board of Global Ministries and the jurisdictional UMVIM offices. 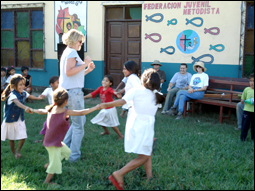 1996–General Conference established the Mission Volunteers Program Area (of which UMVIM is a part) within the General Board of Global Ministries, with instructions to enable the participation of Methodists from throughout the world in global mission volunteer programs so that affirming, empowering, and trusting relationships would be established. 2000–General Conference adopted a resolution recommending that every jurisdiction include in its budget a line item to cover the salary, professional expenses, and office expenses for a Jurisdictional UMVIM Coordinator. 2004–General Conference ruled that “The charge conference shall receive reports annually on all local church organized UMVIM teams, and the total number of local church participants in any UMVIM team, and shall forward the combined report to the annual conference and the general church through the regular annual local church statistical report (247.12 Book of Discipline 2008). 2016--General Conference approved UMVIM Awareness Sunday to be observed annually on a date determined by each annual conference, and that "there may be a jurisdictional volunteer-in-mission (UMVIM) coordinator" added to the Jurisdictional conference section. Both will be in the Book of Discipline 2016.